An ephemeris is a book that contains planetary positions for each day of the year. It is used by astrologers to determine where the planets are located at any given moment in time. 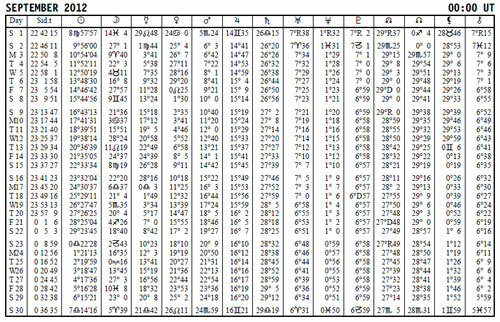 The most popular printed ephemeris for astrologers is The American Ephemeris by Neil F. Michelsen, although in recent years the free Swiss Ephemeris by Astrodienst has become quite popular as well, especially due to its usage in many astrological software programs. The ephemeris will usually display the position of each planet in a specific degree of the zodiac at the beginning of each day. Glyphs or symbols are used as shorthand in order to denote the planets and the signs of the zodiac in an ephemeris. 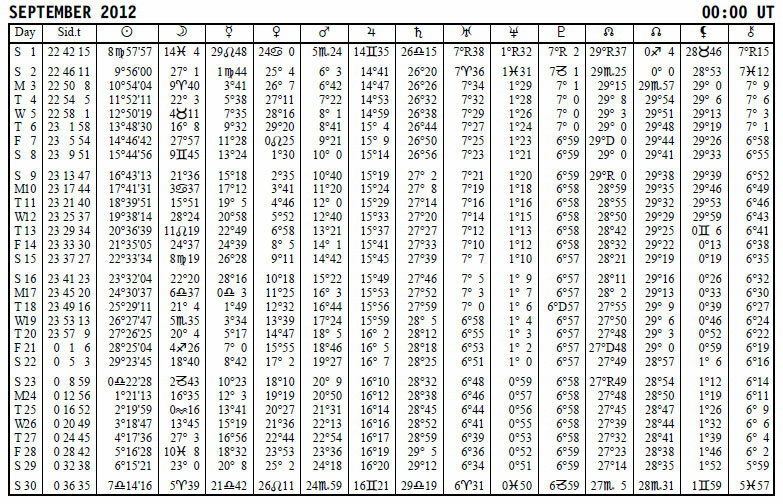 In the past astrologers needed to know how to read and use an ephemeris in order to calculate an astrological chart or horoscope, although the relatively recent advent of computerized chart calculation programs has removed this requirement. Despite this, knowledge of the ephemeris is still a necessary prerequisite for understanding planetary movements and cycles, as well as for studying transits and progressions. The plural of ephemeris is ephemerides.